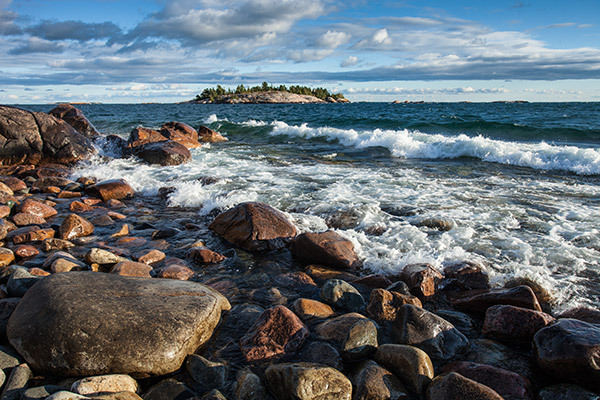 The natural beauty of coastal Georgian Bay has endless possibilities for making landscape photos. 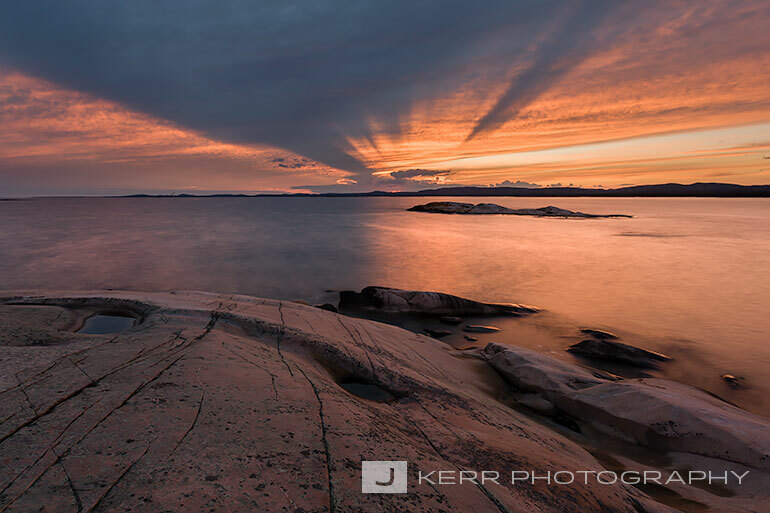 One of my favourite locations is just south of Killarney Provincial Park along the shores of Philip Edward Island. Dozens of smaller islands such as the The Foxes provide incredible, scenic diversity, making it a perfect destination for a 3-4 day adventure. 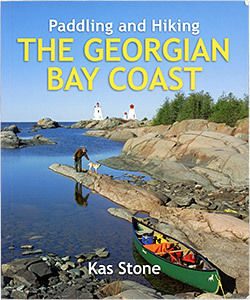 Kas Stone’s Paddling and Hiking the Georgian Bay Coast is an excellent resource for planning your trip. There is a chapter about Philip Edward Island and The Foxes that contains suggested routes, paddling distances and points of interest. The maps in the book aren’t very detailed so you’ll want a good topographic map to plan your route. Friends of Killarney Park publish a waterproof map you can purchase at MEC Toronto or the George Lake park office in Killarney Provincial Park. I recently discovered Jeff’s Killarney Map – a new and beautifully designed topographic map of Killarney Provincial Park and surrounding Georgian Bay. It provides more detail than the Friends of Killarney Park map including suggested camp sites on each of the Fox islands. Best of all, you can download a hires, PDF version of the map for free. A waterproof version of Jeff’s Killarney Map is also available for purchase. I’ve ordered a copy and know that this will be my go to map for the region. The Jeff’s Map website also has some great resources for planning your trip that you should take a look at. If you don’t own a canoe or kayak you’ll want to contact Killarney Outfitters and make a reservation a few weeks before your departure. 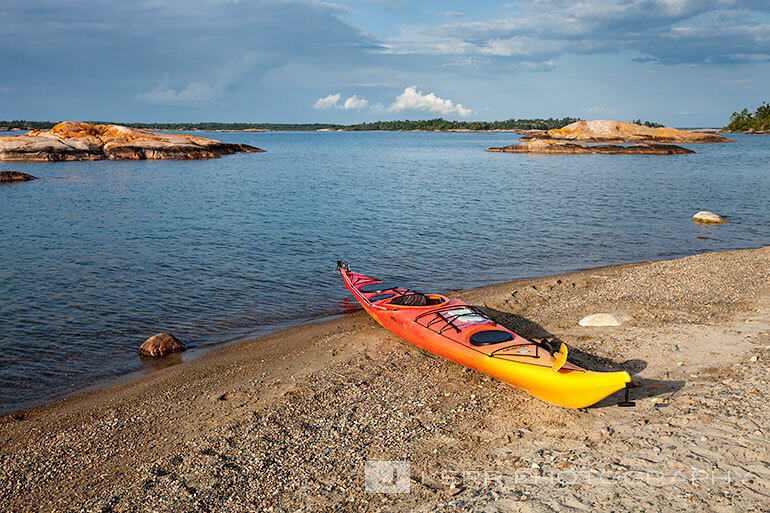 Sea kayak rentals start at $37/day and can be delivered to the Chikanishing Access Point for a $10 fee. 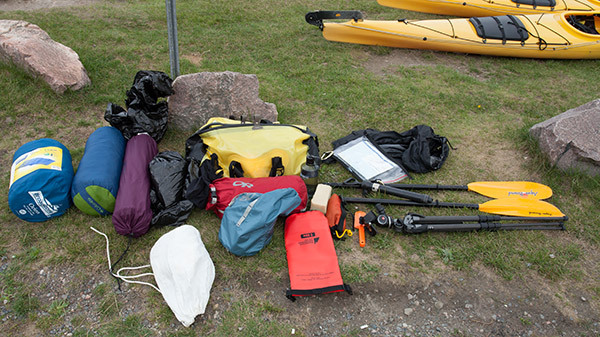 A paddle, PFD, spray skirt, whistle, sponge and pump are included with your rental. The Foxes are on Crown land and don’t require a camping permit, as long as you are a Canadian resident. To park your vehicle at the Chikanishing Access Point you’ll need to stop in at the George Lake park office in Killarney Provincial Park and purchase a daily vehicle permit ($10.75/day). Killarney Outfitters, Chikanishing Access Point and George Lake Park Office. I found that four days, when travelling from Toronto, was plenty of time to explore The Foxes. If you can leave on a Monday morning you’ll avoid the cottage country traffic. The boat launch tends to be less crowded during the week as well. It is approximately 7.6 km to West Fox Island. Depending on the weather and your navigation skills you should be able to make the paddle in two hours. If you stop and take frequent breaks then expect the trip to take longer. You’ll be amazed at how much gear you can pack into a 17-foot expedition sea kayak. I managed to pack a tent, air mattress, sleeping bag, food bag, water bottle, cooking equipment, hiking shoes, clothes, MEC Senate Seat, camera bag and tripod. I like to be on the safe side so I’ve packed my clothes and anything I don’t want to get wet in specialized dry bags. My Lowerpro camera bag fits nicely inside of a yellow Watershed Yukon Dry Duffle that is completely watertight and sits strapped to the top my kayak with carabiner clips. My gear for a 4 day solo trip. A fully charged smartphone with a GPS is also helpful but should not be used as a substitute for a map. A waterproof map works if it gets wet and doesn’t require batteries. My map and my iPhone sit in a waterproof SeaLine Map Case that is clipped to the top of my kayak making navigation quite easy. The weather on Georgian Bay can change very quickly and catch you by surprise. Watch for large waves in open water and keep an eye on the weather. During my first trip to The Foxes I paddled from Sly Fox Island to Centre Fox Island to take some photos. Within an hour a heavy fog rolled in and reduced my visibility to about 100m. I couldn’t see the island where my campsite was (1 km away) and panicked. Foolishly, I wandered off into the fog but found my way back. In 2012, I pitched my tent on the west side of Sly Fox Island without checking the weather forecast. Just after midnight, 50 km/hour winds woke me up as they pounded the side of my tent. I spent the next 7 hours trying to keep my tent from blowing into Georgian Bay. I thought I was going to die. If I had checked the weather forecast I would have known that a wind advisory was in effect for the area. I managed to move my tent to a cove on the other side of the island but it was destroyed. Use your smartphone to monitor the weather conditions before you head out. The smooth pink granite of Sly Fox Island (also known as Unnamed Fox Island) has been sculpted by the water and ice for thousands of years. Massive boulders, water pools and colourful rock formations make this island unique to the others. The bright ochre and orange lichen at the south end of the island provides a stunning foreground to West Fox Island in the distance. On the northwest side of the island you can watch incredible sunsets over the town of Killarney and the LaCloche mountain range. Quite often there isn’t another soul around for miles which makes backcountry camping so appealing to me. 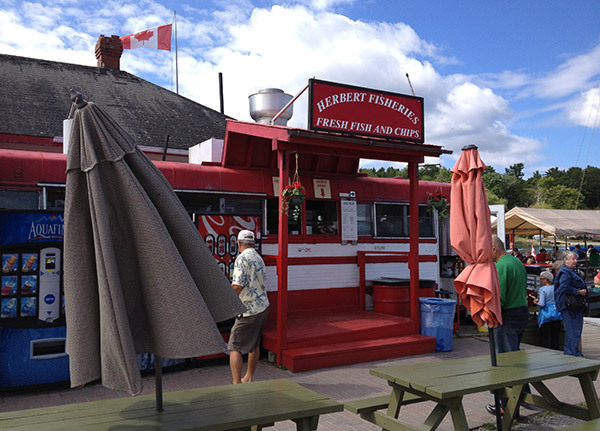 No trip to the Killarney area is complete without a visit to Herbert Fisheries for fish and chips. After a long paddle back from The Foxes, lunch on the picnic tables is a great way to finish your trip. Let me know if this blog post was helpful and leave a comment.